We practice genioplasty under ambulatory, entry in the morning and leaving in the afternoon. 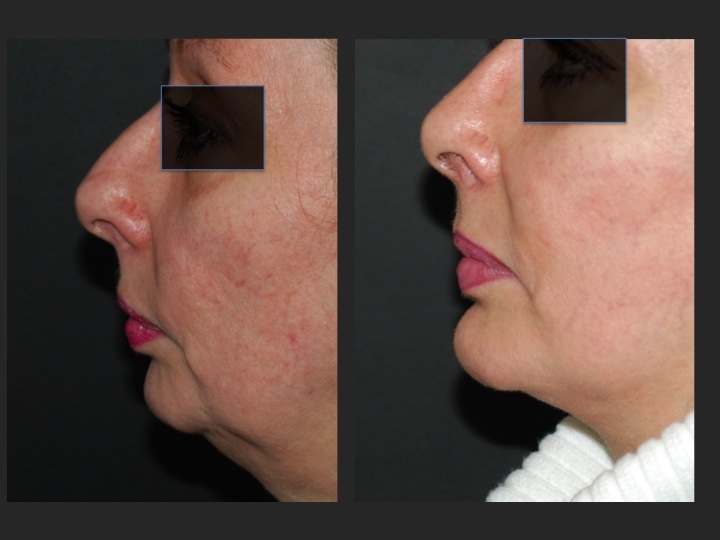 For chin augmentation, we preferably use the Medpor anatomic implants. The rate of genioplasty varies from 3500 to 4500 Euros according to the difficulty of the case. -The backward genioplasty: it will allow the correction of a too long and too high chin. It necessarily implies to cut the bone of the mandible in order to move backward. The scar is hidden inside the bottom lip or under the chin, in particular during a cervico face lift. A facial scanner with 3D reconsctruction will be required before the procedure to model the procedure. The procedure is often practiced under general anesthesia, but can be also considered under neuroleptanalgesia (local anesthesia further by tranquilizers administered intravenously) in case of simple acts (placement of an implant under the chin). This will require a pre anesthetic consultation, at least 48 hours prior the procedure. In most of the cases, the procedure is practiced under ambulatory hospitalization (entry at 08:00am and leaving at 07:00pm on the same day). The placement of an implant is not very painful. The osteotomy can cause an important swelling of the face which can be painful for the 3 following days. We should consider 5 to 7 days interruption of work after a genioplasty. -We can work more precisely the sides of the mandible without risking to damage the lower dental nerves. -The Medpor implant has great tissue integration and a very low rate of a capsular contracture. What are the potential complications of a genioplasty? The genioplasty is a delicate surgery which required a rigorous technique from the surgeon if he wants to obtain a harmonious chin. The most frequent complication is a decrease of sensitivity of the bottom lip as the dental nerves stretch. This is usually transitory (less than 3 months) but can be inconvenient. At least, post operative edema can be consequent and can lead to a social eviction of more than 7 days. What are the other procedures that could be associated to genioplasty? Above all, rhinoplasty. This association is quiet frequent as we often see patients with a prominent nose and a receding chin. We qualify it as a profile-plasty which restores the balance of the face. We often associate genioplasty by implant to a cervico face lift. In fact, patients with a receding chin often have a relaxed neck because their jaw does not tighten the muscle enough. 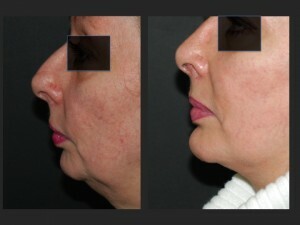 A chin implant allows to correct the phenomenon and to improve in a spectacular way the effect of a cervico face lift. At last, in some cases of moderate cervical relaxation, we can associate a liposuction of the neck to a genioplasty by implant. The neck is tighten again only with a small scar located under the chin without a crevice face lift. Is there any genioplasty taken care by the national insurance? Yes, some cases associated to an abnormality of the bones bases and the articulated dental (class 2 and 3 of angle) can be covered by the national insurance. An orthodontic treatment is necessary before hand. Our additional fees are between 2000 to 3000€ according to the difficulty of the case. How much costs a genioplasty? If it is an act associated to another cosmetic surgery procedure, the genioplasty will cost an extra 2000€. Hello, we perform this surgery on a regular basis. We use l’espoir or porous titanium custom made implants. The price is between 4500 and 6000 euros.